Thrift Store Treasure Hunting: Are You a Digger Too? I was featured in All You Magazine today with my article about Thrift Store Treasure Hunting. I would love it if you would take a look and even give me a little Facebook love by sharing my article! Thank you! thank you! if you do this for me! Kind of a big deal in my little world! “Writing a frugal blog and sharing tips for saving money is my passion and my hobby. I admit, there are days when I just need some retail therapy. Instead of wandering around the mall or online shopping, I get my kicks at thrift stores and consignment stores. My current favorites: Goodwill and Savers. If you don’t want to do all the digging, consignment stores have done much of the work for you but you will pay more too. 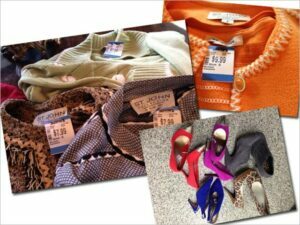 I love to visit consignment stores and thrift stores when I am traveling. I use reader review sites like Yelp to guide me. My sister sells her thrift store finds on eBay and makes a few extra dollars each month. She enjoys earning extra money and sets aside one day a month to photograph and post her items. Last month, I purchased five St. John Knit twin sets at a Savers in New York while visiting my family. Each sweater set was either $7.99 or $9.99. These can retail for over $1,000. To the lady who cleaned out her closet, I thank you! These will look fabulous with my Ferragamo shoes, which also cost $7.99! If you see me and I look like a million bucks, well I paid about $15 dollars for the outfit! My daughter needed a new pair of shoes for a concert she was attending and between work and school, she did not have time to go shopping. I went to my local Goodwill store and sent her the shoe photo above. The two pairs with the silver tips are from Target — brand new with tags on them. My daughter could not decide between the blue shoes (Via Spiga) and the gray booties (Shoe Dazzle), so I bought them both for under $20. • Always try on the clothes and search carefully for rips, holes or defects. • Find and use an inexpensive tailor. Many items can be repaired and altered for just a few dollars. • I use an “at home” dry cleaning kit for many of my thrift store finds, or I wash everything before wearing. • Keep a list of needed items to round out your wardrobe. Perhaps that pair of pants you never wear needs a specific style top or shoe to get it out of your closet. • Find one or two items to donate. You don’t have to take the time to clean out your entire closet! I keep a laundry basket inside my closet for this purpose. My husband, daughter, and I love Savers because it is so organized and inexpensive. We discovered the UCLA Thrift stoes in LA and found some good buys in high end clothes. We also go to the Habitat for Humanity Re-stores when we do projects around the house. I did not know about the UCLA Thrift Stores. That is an easy “field trip” from Orange County. I will take my daughter who also is a good thrift-store digger. Habitat for Humanity is a great source too. Thank you for the great contribution!